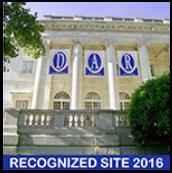 In addition to being a lineage society, DAR is also a women’s volunteer service organization. The Cumberland County Chapter joins other chapters across the country in serving the DAR mission to promote historic preservation, education, and patriotism. Every year the Cumberland County Chapter holds the DAR Good Citizens essay contest. Awards are given to outstanding high school seniors in school districts and private schools throughout Cumberland County. The chapter also hosts the American History Essay contest for fifth through eight grades, and the Christopher Columbus Essay contest for ninth through twelfth grades. Our members collect personal care items each year and deliver them to the Lebanon Valley VA Hospital. 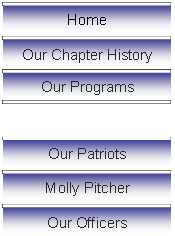 In support of DAR Project Patriot, our chapter participates in a program through Adopt-A-Base. We send coupons to a US Army Base located in Vilseck, Germany. Our members collect grocery store coupons which are delivered to families stationed at the base and can be used at the Commissary and PX. Every June, chapter representatives attend Naturalization Court in Carlisle and present our new citizens with an American flag and DAR card printed with the Pledge of Allegiance. To mark the 45th anniversary of the chapter, an historical marker was placed on the Square in Carlisle on November 16, 1940. On April 17, 2010, the chapter marked the grave of Real Daughter, Mrs. Jane Stevenson Marshall, at the Old Carlisle Cemetery. Real Daughters are ladies whose fathers were Revolutionary War patriots. The Army Heritage Center in Carlisle serves to educate the public about the Army’s contributions, and honor the service of its soldiers and families. In May 2012, our chapter placed a bench near the American Revolutionary War exhibit along the Army Heritage Trail. In May 2013 the Bosler Memorial Library in Carlisle completed an expansion and renovation project. To support the library’s expansion efforts, the chapter made a donation to assist with new landscaping. Our current chapter regent’s project will honor patriots buried in the Old Cemetery in Carlisle by erecting a new marker of additional names. An ongoing project is research for eventual publication of a book documenting the homes of Revolutionary War patriots in Cumberland County. If you have questions regarding membership, please feel free to contact our registrar.